Someone once wrote “If you want to touch the past, touch a rock. If you want to touch the present, touch a flower. If you want to touch the future, touch a life.” Ray of Hope is blessed to have hundreds of supporters who touch lives every day. In this issue, meet a group of nurses who care for our guests’ hurting feet and a volunteer who provides a warm welcome to Marketplace clients. Many Ray of Hope clients, especially those who are homeless, walk miles each day—often in worn-out shoes. They develop fungal infections and sores that can develop into more serious conditions if they’re not treated quickly. Since 2011, a group of dedicated nurses have volunteered at the Ray of Hope Community Centre (ROHCC). Linda Jacobs, Linda (Dawson) Heber, Ann Moore, Amy Guilhauman and Maria Urbarri, backed up by Janet Campbell, work to keep our guests’ feet as healthy as possible. And now, these nurses have helped supply Ray of Hope’s foot clinic with its own equipment, through an amazing $7,500 donation from their professional association. “We want to buy better equipment to serve people better,” Linda Heber says. 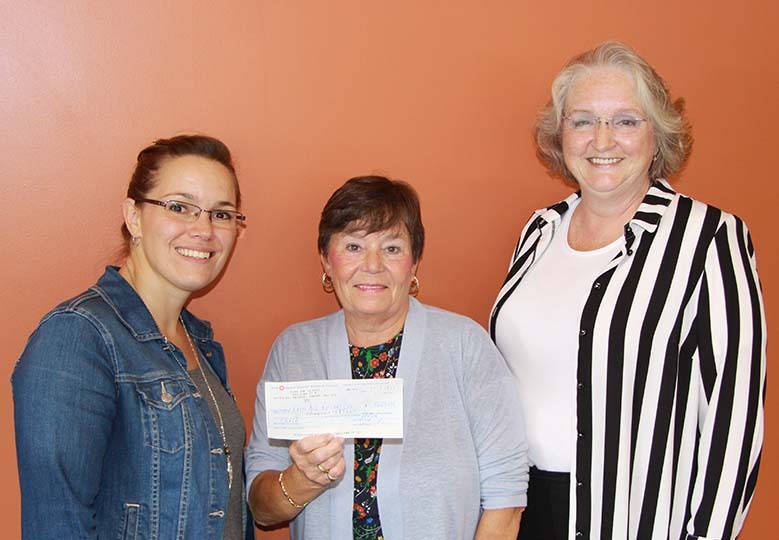 ROHCC Director Jessica Van Es (left) accepts a $7,500 cheque from Ann Moore and Linda Heber of the Nurses Entrepreneurial Foot Care Association. The women belong to the Nurses Entrepreneurial Foot Care Association of Canada (NEFCA). When NEFCA closed last year, its members asked that the association’s funds be allocated to a not-for-profit clinic that offers free foot care. Linda Heber, NEFCA’s president, lobbied the membership on behalf of Ray of Hope. NEFCA also made a matching donation to the Salvation Army’s foot clinic in Woodstock, which, she notes, was inspired by ours. The donation means that the nurses will no longer have to bring their own equipment. Until now, “the two Lindas” (Jacobs and Heber) have (literally) footed the bill for Ray of Hope’s clinic. They bring in their own supplies. They approach companies in the foot care industry for donations of items, like the diabetic socks that SIMCAN Enterprises in Cambridge provides. Linda Heber donated the chairs clients sit in and even makes the lotion that each person receives. 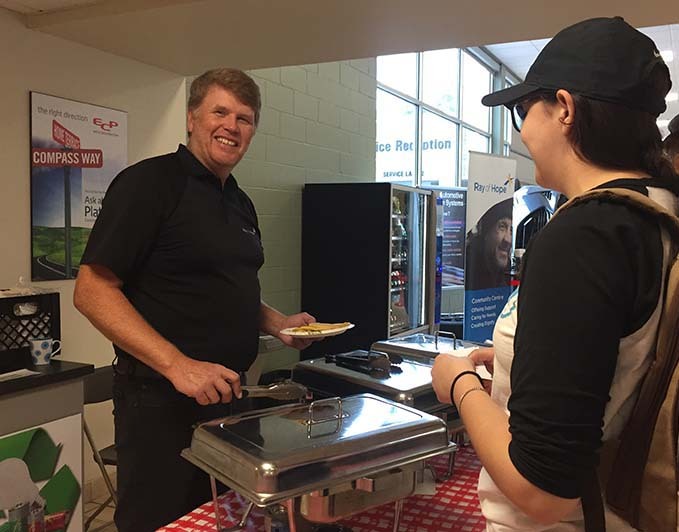 On Saturday, September 22, Heffner Toyota Lexus held its 6th Annual Charity Pancake Breakfast. 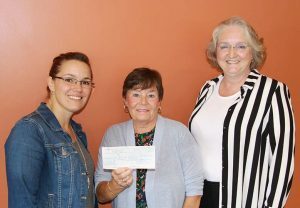 Funds raised will help support Ray of Hope’s Youth Employment programs. Heffner’s, a long-time supporter of Ray of Hope, is also home to one of our Morning Glory Cafe locations, where young people gain valuable employment skills and on-the-job experience. Sometimes food isn’t the most important item people receive at The Marketplace, Ray of Hope’s hamper program. It’s compassion. Deb Drost is a regular Marketplace volunteer. She joined Ray of Hope in 2015 after hearing about it through her former church and seeing a posting on the Volunteer Action Centre’s website. Now you’ll find her at the Community Centre every Tuesday evening, greeting guests as she registers them for their once-a-month appointment to pick up a few groceries. One of the things Deb enjoys most is the chance to meet folks from all walks of life — staff, other volunteers and, of course, clients. For Deb, volunteering is also a chance to make a difference in someone’s life. Someone like the man who appeared at The Marketplace one day looking for soap, shampoo and a razor. He had a job interview the next day and wanted to look his best. 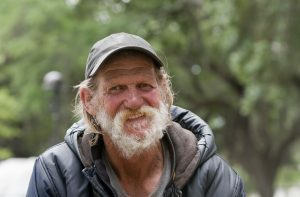 Marketplace volunteers supplied him with the toiletries and wished him luck. The next week, he was back — shaved, neat and smiling. He wanted to let the volunteers know that he got the job. Can you help The Marketplace? Our hamper program relies on the Food Bank to stock the shelves. Sometimes supplies (especially protein items like peanut butter, beans and canned meat or fish) get low. “You always wish they had much more. But certain times of year it’s tougher because the Food Bank doesn’t have as many drives,” Deb says. You can help by donating items to the Food Bank through the collection boxes in your grocery store or by dropping them off during business hours at the Ray of Hope Community Centre. Thank you! Hope Heroes will be a regular feature of Hope in Action. It’s one small way to recognize the amazing people who contribute their time and talent to Ray of Hope. Thank you, volunteers, for everything you do!